It’s that time of year again! That’s right, time to hit the books – figuratively speaking, of course! Whether you’re going back to school, starting a new job, or just getting back into the swing of things after a hot, hazy summer off, there’s no doubt that September carries with it a certain “new beginning” kind of feeling – new school year, new job, new exercise regime…new books! So, break out your corduroys, breath in that unique fall air (mmm…drying leaves and pencil shavings), and prepare yourself for a great fall! In the tradition of new beginnings, we are pleased to announce that Titles@Table40 is back for the fall season! We have a fabulous lineup for you with everything from humour to history. First up, we will be welcoming cherished local restaurant reviewer Anne DesBrisay on Sunday, September 18. A bit of a switch from her Capital Dining books, Ottawa Cooks is a beautiful cookbook featuring recipes and stories from some of the finest chefs in our Nation’s Capital. On Wednesday, October 26, Steve Patterson, the host of CBC’s The Debaters, will be here to tickle our funny bones with his new book The Book of Letters I Didn’t Know Where to Send. A collection of grievances against everything from gluten to spandex, this book is touching and delightful in equal measure. In the lead up to Christmas, we have two events back-to-back. On Sunday, November 20, local photographer William McElligott will be at Table 40 to present his new coffee table book, Ottawa, Canada II and Charlotte Gray will be joining us on Sunday, November 27 for our last Titles@Table40 event of 2016. Her new book, The Promise of Canada, explores what it means to be Canadian and celebrates all the ups and downs of our rich 150 year history. The evenings start at 5:30pm with dinner, followed by the author presentation and book signing. Attendees must reserve their spot through the bookstore with a non-refundable deposit of $20.00 which will go towards the cost of their meal (a set menu with a vegetarian option). The total cost of the meal is $40.00, which includes three courses (family-style). Tax, 18% gratuity, and refreshments are not included. Tickets are now available in-store for our September and October dinner events. Tickets for our November events will go on sale Friday, September 30. In addition to Titles@Table40, we have a few in-store author signings to tell you about. On Saturday, September 10 from 12:00-2:00pm, local author Lyse Champagne will be here to sign copies of her new book The Light That Remains, a collection of short stories about refugees. Ottawa mystery author Linda Wiken (a.k.a. Erika Chase, the author of the Ashton Corners Book Club series) will be in the store on Saturday, September 24 from 1:00-3:00pm signing her new novel, Toasting Up Trouble, the first book in the Dinner Club Mystery series. Just peaking into October, be sure to swing by on Thursday, October 6 at 5:00pm for Margaret Southall‘s launch of her new book A Jacketing Concern. Rounding out that first week, Elie Nasrallah will be here from 1:00-4:00pm on Saturday, October 8 to sign copies of his two books, None of the Above and Hostage to History. We look forward to seeing you at some of these great events! Like the return to work and school, September marks a new beginning for bookstores as well. While we receive new books throughout the whole year, September ushers in the fall book season, also known as the lead up to that most joyous (and busy) time of the year, Christmas. 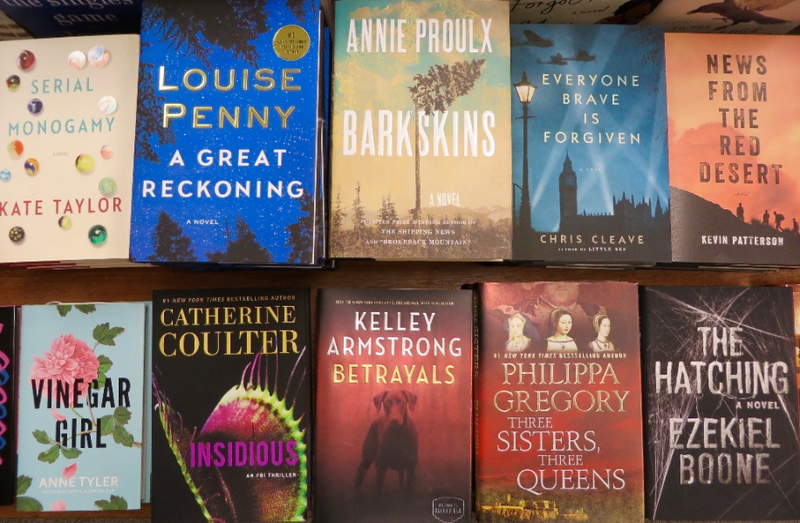 This year, we’re off to a great start with the brand new release of Louise Penny‘s A Great Reckoning, the twelfth Inspector Gamache novel. In that same mystery vein, local favourite Barbara Fradkin‘s new novel has just hit our shelves. As the first installment in a thrilling new series, Fire in the Stars introduces readers to international aid worker Amanda Doucette who, after surviving a horrific trauma in Nigeria, returns to Canada and joins forces with an RCMP officer in order to find a friend who has gone missing in Newfoundland. If you were one of the many readers who couldn’t put down Missing, Presumed by British writer Susie Steiner over the summer, why not follow it up with Canadian Shari Lapena‘s The Couple Next Door? A captivating vortex of lies, betrayals, and secrets, this psychological thriller will keep you hooked to the very end. On the historical front, Steven Price has given us a true gift in By Gaslight, a mysterious thriller set in Victorian London, and Kate Taylor‘s debut novel, Serial Monogamy affords us an intriguing look into the life and affairs of Charles Dickens and his young mistress, Nelly Ternan. Since the kids are heading back to school, parents are going to have to get back into the routine of packing lunches and snacks to get their little ones (and big ones) through the day. This year, instead of the traditional ham and cheese with an apple on the side, how about stepping outside the lunchbox a bit with some Cybermelts or Timey-Wimey Watch Scones? Those are just two of the forty wibbly-wobbly, timey-wimey recipes in Doctor Who: The Official Cookbook by Joanna Farrow – the perfect addition to any Time Lord’s kitchen (or Tardis). Not to be left out, we’ve had a great start to the month in our children’s section as well. For readers aged twelve and up, Riverkeep by Martin Stewart is a dark, magical coming of age adventure about a boy who must conquer a wild, treacherous river and a monstrous sea creature in order to save his father’s life. British author Justin Fisher has just released his debut novel for the middle-grade set, Ned’s Circus of Marvels. When young Ned realizes that everything magical that he’s every read about is real, he suddenly finds himself on a quest to save the world with the help of a robot mouse, a girl witch, and an amazing flying circus. There are also some real treasures right now in our children’s picture book section. Here are a few of our favourites: The Cranky Ballerina by Elise Gravel – a funny story about discovering the things you really love; They All Saw a Cat by Brendan Wenzel – a lovely book about how everyone sees things from different perspectives; King Baby by Kate Beaton – a hilarious look at how life changes with the arrival of a baby; and Waiting for the Whales by Sheryl McFarlane and Ron Lightburn – a gorgeous reissue of a twenty-five year old classic about love, life, and family. Looking a little further ahead into September, there are lots of great books still to come. Ann Patchett follows up the success of Run, Bel Canto, and State of Wonder with a new family saga, Commonwealth (September 13). Nutshell by Ian McEwan (September 13), a novel of deceit, murder, love, and betrayal, is bound to be a real treat for steadfast McEwan fans and newbies alike. Canadian treasure Kenneth Oppel, makes his first foray into the teen market with Every Hidden Thing (September 20), a riveting story of romance, science, history, and paleontology. Atlas Obscura by Joshua Foer (September 20) is a fascinating gift book which celebrates over 700 curious, hidden wonders of the world. Keep an eye out for these (and countless other) wonderful books as they make their way onto our shelves and into your hands! The nights are getting cooler, the days are getting shorter, and Mother Nature has decided it’s time for a makeover. While you’re switching over your closet and getting school and work supplies all sorted for the fall, don’t forget to give your bookshelf a bit of TLC. As the seasons change around us, there’s nothing quite as comforting as the constant companionship of a book.